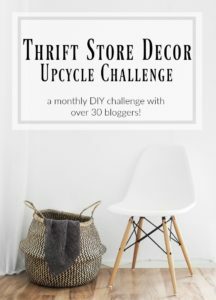 It’s the second edition of the Thrift Store Decor Upcycle Challenge for 2017. As a quick reminder, we each take a secondhand item, and upcycle into something new and fresh for the home. 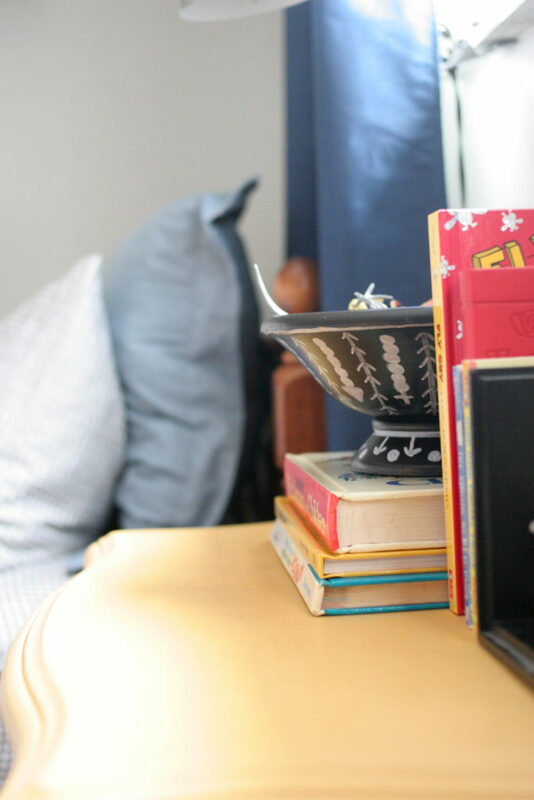 You can really find so many treasures in a thrift store — and the affordable price point gives you freedom to be creative! 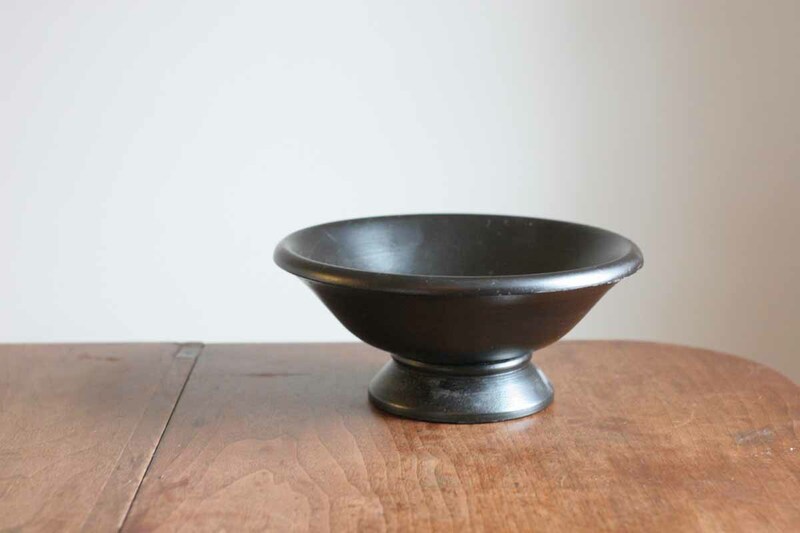 This month, I’m showing you how to give a basic wood bowl a custom look. 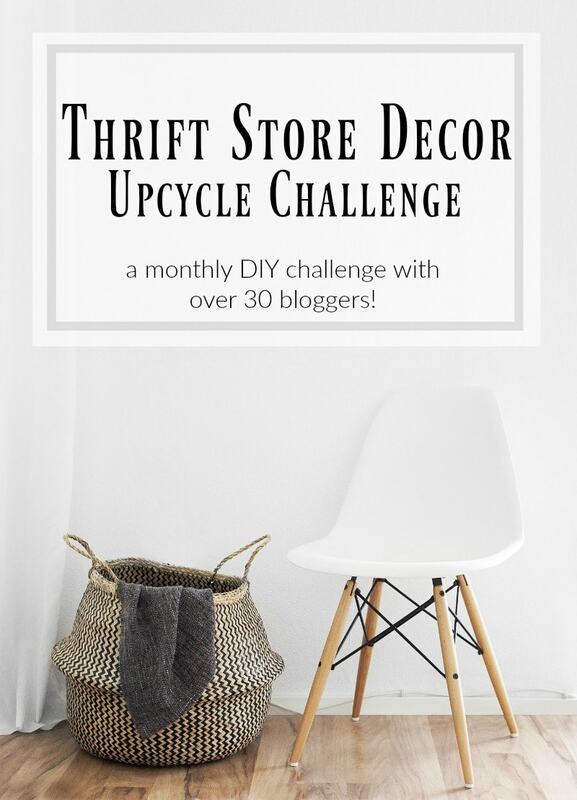 There are 30 bloggers participating, so you will have plenty of inspiration for your next visit to a thrift store. What are your favorite items to collect at a thrift store? I’m a sucker for baskets, vintage art, and decorative bowls — to name a few. 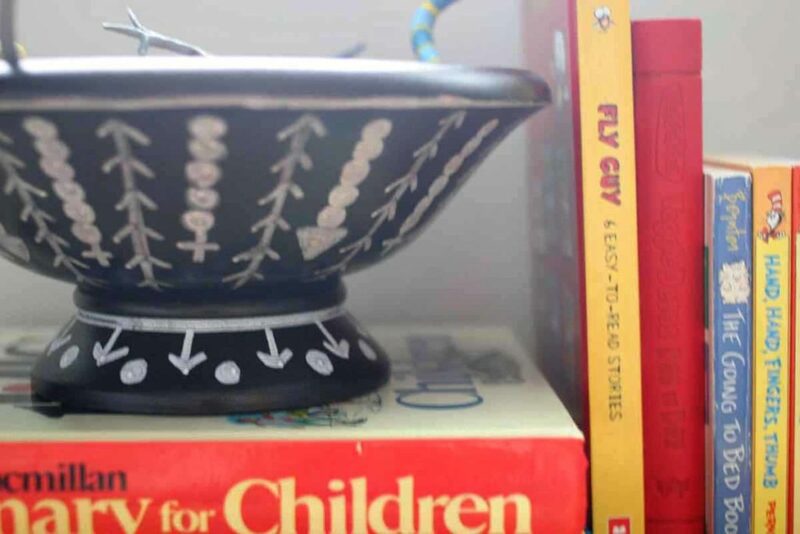 This black wooden bowl was one of those finds — and it has been handy to hold crayons, puzzle pieces, and more. It doesn’t have much personality, though, and I was ready to give it a more custom look. Step 1: Start by giving the bowl a quick wipe-down, making sure to remove dust and residue from the surface of the bowl. Step 2: Settle on the tribal, or geometric design, you want to create. I liked a mix of lines, angles, and circles. My camera broke in the middle of this project, so I don’t have in-process shots, but I’ll do my best to explain. Step 3: Begin by drawing lines with a chalk marker. 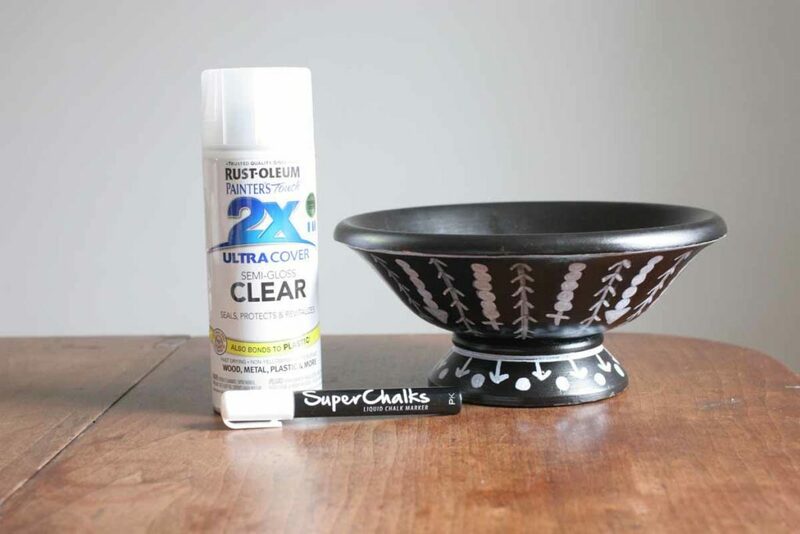 I love Super Chalk Markers and have used them for several projects including an Aztec Console Table and a Prayer Chalkboard. I drew lines from the base of the bowl to the top edge, each approximately 1.5″ apart. I did not measure. To me, the imperfection of a hand drawn tribal design is part of the appeal. Step 4: After I completed each line, I drew the angles to create a “fishbone” effect on the line. Step 5: Next, I added rows of circles between each “fishbone” line. They looked busy, so I colored them in and made solid circles. Step 6: At the end of each circle row, I added either a plus sign or solid triangle. I should note, I was really making this up as I went. There is no reason to overthink a craft project, like this tribal bowl. Be creative! Step 7: To highlight the shape of the bowl, I outlined the upper rim and the pedestal base. Step 8: Finally, to accent the pedestal, I added alternating arrows and dots on the base. Step 9: In order to protect the chalk lines, apply a light coat of Clear Spray onto the finished bowl. 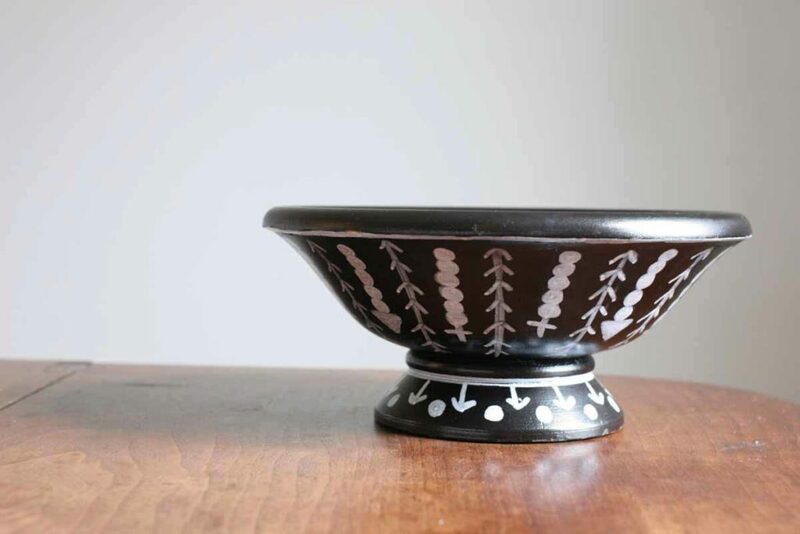 Lora – this tribal bowl is fantastic! Love your creativity! At first glance, it did not look like chalk paint! Great job. Visiting from Thrift Store Challenge. Fun way to update a boring pedestal bowl! It looks great. I have a weakness for thrifted baskets, lamps, and bowls. I love what you did to this bowl. I would love to try something like this on my bowls. Great job! Wow, what a great and easy project that really elevated that little bowl to something elegant and display worthy. Words would be cool! It could be a poem, lyrics, scripture, all kinds of things! Oh I would of snagged that bowl! Love this idea too. Great upcyle! It definitely looks tribal! great idea and nice repurpose! I also learned that they make chalk markers! Thanks! Chalk markers are great 🙂 You’ll have to try them! Very creative. Love this project. Wow, I love the look of this! Great job! I am a sucker for bowls and baskets at thrift stores too. And this has to be the easiest DIY ever! I am loving the pattern you chose – so cute! It is simple! So simple! This is amazing! I would have never known it was chalk. It looks inlaid. Great job! Very cute idea! I love the way it turned out! I love what you did with the bowl! I never would have thought to use chalk paint markers. What a cute little bowl. And so clever to preserve the chalk with the spray. Thank you for sharing. Clever way to quickly transform a bowl. Love the tribal design. This is gorgegous. What a great way to update a wooden bowl. Your bowl looks great! So cool!